Micellar water is definitely having a moment on the high-street right now. It's a great alternative to using face wipes to take your make-up off and it's much better for your skin. Nivea have just brought out their 3 in 1 Micellar Cleansing Water. It's a super gentle micellar water which is an essential for every busy modern girls beauty bag! I picked mine up on offer in Boots for about £2 and I'll loved using it everyday since. 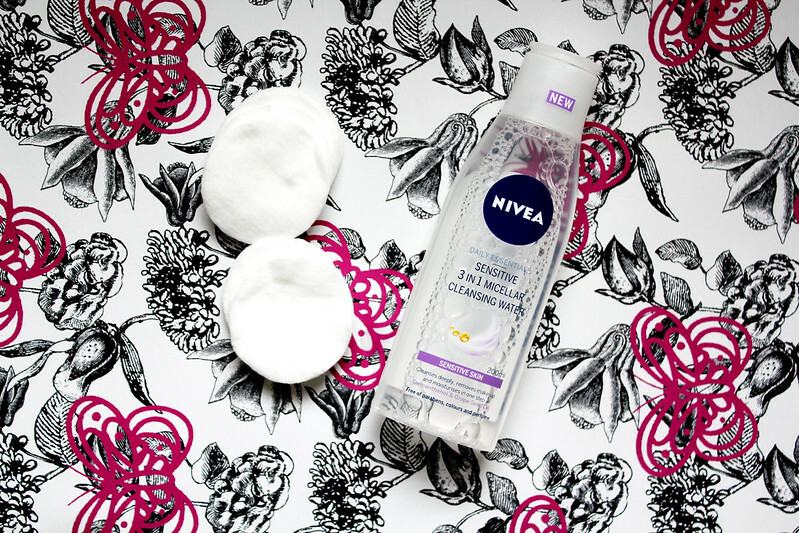 Nivea is offering a much more affordable micellar water and this one is specifically aimed at girls with sensitive skin. It's a lot less effort then using other micellar waters and it leaves my skin feeling clean and refreshed and completely make-up free. To take my make-up off in the evening all I do is take about 6 cotton wool pads and cover a couple with the micellar water and wipe my make-up off. It's so simple and I never use anymore then about 6 pads each night. The formula for this micellar water is very different from others on the high-street. It's much more sensitive so it is perfect for removing eye make-up as well. Here's some links if you want to know more about Nivea. Check out there Website, Twitter and Facebook. interesting...so curious to try it! sounds great, will try and give it a go ! Think I prefer Garnier Micellar Water. I find the Nivea stings my eyes even though it's for sensitive skin.